A CV joint (constant velocity) joint is a type of multi-ball flex joint that connects two fixed rotating shafts and is designed to transfer force from the engine and transmission to the drive wheels. Theses joints have a wide range of motion that is broader than conventional U joints. CV joints are also designed to deliver engine torque more evenly throughout their range of motion where as U joints give isolated movement in extreme angles. Consisting of a series of six hardened metal balls encased within its housing while using an inner metal cross (center) in which the axle is connected. These joints can be disassembled and inspected by removing the axle and forcing the inner cross beyond center. This will allow the balls to be removed, inspected and reassembled. These joints are lubricated by graphite based grease which is held inside the joint by a rubber CV boot is used to prevent grease from being thrown out of the joint while in operation. Once a boot has failed it should be repaired to prevent failure and a more costly repair. A CV axle is supported by a CV axle bearing which is held inside of a suspension spindle which will turn side to side with the steering wheel on front wheel drive cars. Service on this style of joint is minimal with the exception of a visual inspection of the boot the joint will continue to operate. The first signs of failure include clicking while turning under power and vibration under acceleration. 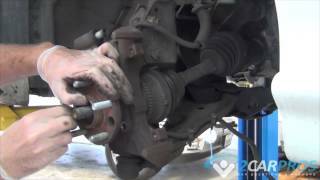 The CV axle must be removed and inspected by checking the range of motion and looking for any rough spots in the motion. Some manufacturers design the joint to be replaced as a full axle assembly only. 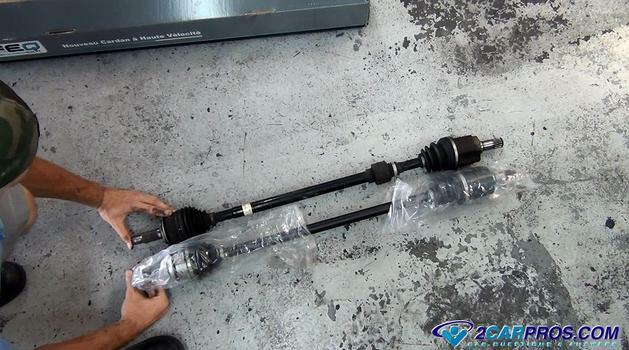 If you have any CV axle questions, please visit our forum. If you need car repair advice, please ask our community of mechanics is happy to help you and it is always 100% free.